Getting started with vegetable container gardening can seem overwhelming but it doesn't need to be complicated. 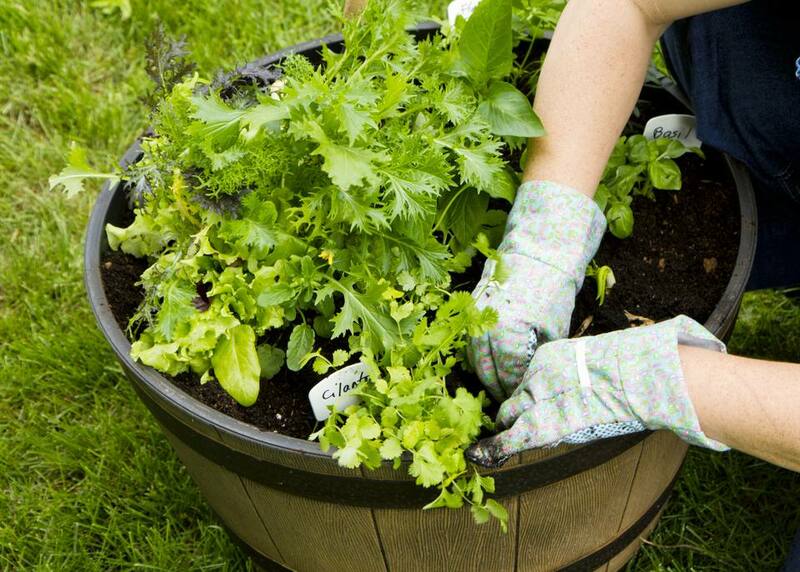 In a nutshell, all you need for vegetable container gardening is plants or seeds, a container, some good potting soil, fertilizer, plenty of sun and water. Growing vegetables in pots doesn't need to take a lot of time, but it does require that you pay a certain amount of attention to your plants, usually on a daily basis. There are lots of advantages to growing vegetables in pots. For people with limited outdoor space, growing vegetables in containers may be the only way to go. But even people with a backyard the size of a football field should consider it. There's no weeding, less chance of soil-borne plant diseases and critters are less likely to be able to eat your vegetables. Also, many people simply have bad soil for gardening, and you buy great soil for pots. While growing edibles in pots can be really rewarding, but it can also be challenging. Knowing the basics before you start can give you the best chances for success. You can grow almost any vegetable in a container. That said, I don't think I would try corn or large watermelons due to size requirements and degree of difficulty. To decide what you are going to grow, think about what you like to eat. I love fancy mesclun salad greens, which can be expensive and hard to find, so I grow lots. My kids love peas and they are fun to eat right off the vine. I don't think there is anything better to eat in the world than fresh picked tomatoes and potatoes so I grow those as well. One of your first decisions will be whether to buy seedlings or start your vegetable plants from seed. There are two huge advantages to starting from seed. The first is price - most seeds are very inexpensive. The second advantage is that you can grow plants that are hard to find. The one drawback to starting vegetable plants from seeds is that seedlings are delicate. Where a large seedling might survive if it gets a little dry, a newly sprouted seedling will surely die. You can either directly sow seeds into your pots, or to get a jump on the gardening season, you can sow your seeds indoors, usually in late winter or early spring, depending on where you live and the kinds of seeds you are planting. Consider asking yourself these questions before you start seeds indoors. Here are some common seed starting mistakes and how to avoid them. And 6 tips for successful seed starting. To save money and maximize your chances for success when starting seeds indoors, you can make a free, self-watering seed starter. In spring, before you plant young seedlings outside, you must harden off your plants to get them used to being outside. The advantages of growing organic vegetables. Do water crystals save water? All you really need to grow vegetable container gardens is a container, soil, fertilizer, water, sun, and plants or seeds. That said, there are a lot of cool products that can be really helpful.